Photo by Frank Gehry Partners. The future of downtown Los Angeles? 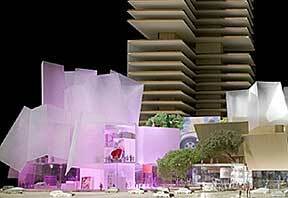 Billionaire real estate developers have unveiled a plan to "remake" downtown Los Angeles. Artist Mark Vallen gives us the details. Reprinted from Vallen's weblog: www.art-for-a-change.com/blog (Tuesday, April 25, 2006). On April 24, 2006, architect Frank Gehry unveiled his plans for the $750 million dollar re-design of downtown Los Angeles, an undertaking that is the first of a three phase $1.8 billion "improvement" project to be overseen by real estate tycoons, The Related Companies of California (www.related.com/index.asp?model=homeRelated&view=1&companyid=7). Construction is slated to begin this coming December. Mr. Gehry envisions "developing" a three acre area adjacent to the Walt Disney Concert Hall (which he also designed), situated along historic Grand Avenue - a district to be bursting at the seams with majestic luxury hotels, grandiose condominiums, restaurants, rooftop pools and bars, splendid retail pavilions, a health club and spa, and oh, yes - "100 affordable apartments." Something tells me a humble painter like myself won’t be able to come up with the money for one of those allegedly reasonably priced apartments. The New York Times reports (www.nytimes.com/2006/04/25/arts/25gran.html?_r=1∨ef=slogin) that the goal of Mr. Gehry, with backing from the Los Angeles Grand Avenue Authority (comprised of county and city officials and chaired by billionaire Eli Broad), is to "create a new, tightly woven community downtown as well as a fresh destination for the area’s 17 million residents and the 24 million visitors it has each year." The re-design will apparently connect the Grand Avenue neighborhood to LA’s downtown cultural center, which is comprised of Disney Hall, the Music Center, the Colburn School and the Museum of Contemporary Art. Mr. Gehry is supposedly straining to design public space that will capture downtown LA’s identity, and he is quoted as having said "It’s not New York, it’s not Paris - it’s a different image and we’re struggling to find it." I’m not struggling to find it, it’s not difficult to locate at all, it’s right there on the streets of the area to be gentrified. Grand Avenue is already home to a "tightly woven community" of poor working class Spanish speaking immigrant families and their businesses. On March 26, 2006, some 2 million of them demonstrated for immigrant’s rights (www.xispas.com/blog/2006/03/2-million-people-march-in-los-angeles.html), marching in the same area targeted by Gehry and his backers. Mr. Gehry should take a walk in that quarter of the city, but then, perhaps he already has, and he promptly put out of mind what he discovered. It’s a fair guess no one actually bothered to ascertain the needs and desires of those who live and work along Grand Avenue, but then, they can’t afford luxury condominiums, so why bother? I was born in Los Angeles and I grew up on its streets, I know every back alley of downtown LA and once had an art studio in its abandoned industrial area. I’ve been drunk on those downtown streets, and wandered the asphalt labyrinth looking for inspiration. I’ve been chased by the riot squad along downtown boulevards and had illuminating conversations with homeless sidewalk philosophers. I’ve conspired with poets and artists in seedy downtown bars, and followed dreams along the concrete banks of the LA river - this is my city, I love it and I belong here. But no one ever asked me how I thought the downtown area might be improved. There was no debate or vote, billionaires simply swept down and told us how things would be - they decided the fate of my city. You can see the skyline of downtown LA from Skid Row - where some 11,000 people live and sleep on the filthy cold streets in makeshift huts constructed from cardboard and rubbish. The Los Angeles Homeless Services Authority reported in 2005 that the number of homeless people in LA County on any given night had reached approximately 90,000 individuals, making Los Angeles the homeless capital of the United States. $750 million dollars would go a long way in alleviating such human misery. Despite promises made by the Los Angeles Grand Avenue Authority, many large businesses have not been lured to the downtown area. The LA Times reports (www.latimes.com/news/local/la-me-grand25apr25,0,2713405.story?coll=la-home-local) that high-end retailers are fearful of the homeless and low returns on corporate investments. "We’ve looked at downtown a lot, and I have not been able to answer the primary question of who is my customer on evenings and weekends," said Rick Caruso, the developer behind several super mega malls in Southern California. I’ve spoken here of the social realities framing the announcement of a new downtown center for Los Angeles - but what about questions pertaining to aesthetics and architecture? The Gehry/Los Angeles Grand Avenue Authority plan is promoted as an avant-garde venture with its glittering high-rise towers, cubist buildings of translucent materials, and pavilions of glass and limestone, but to me it all masks something unspeakable and profoundly undemocratic - it’s a monument to hyper-consumerism and centralized power. Andy Merrifield, writing a book review for Harvard Design Magazine about the French Situationists and their views on architecture (www.gsd.harvard.edu/research/publications/hdm/back/12books_merrifeld.html), put his finger on what bothers me: "Ultimately, the Situationists remind us of what’s gone, of the cheap thrills of the everyday city, the city now beleaguered from every side, airbrushed by corporate logos, plagued by burgeoning rents and inflated property values, greed and exploitation. The Situationists still sing a paean to the oppressed minor leaguer, to those who play in worn-out city ballparks—to those who still mix and mingle in street-corner societies in the fast-disappearing affordable parts of the city." Surely, it is argued, the renewal of downtown LA and its transformation into a vital cultural center would be a good thing, a truly progressive accomplishment - but is this in point of fact, being offered to the people of Los Angeles? Let’s not get sidetracked in a discussion over Gehry’s abilities as an architect, the real issue here concerns the relevancy of a "city center" for a huge sprawling megalopolis like LA that actually contains several very diverse focal points. Dispersing $1.8 billion worth of development money to underserved and forgotten communities, with the express purpose being the construction of cultural centers, would do much to advance the arts and improve the quality of life in LA. The needs of bureaucratic government and corporate greed are served well by the Gehry/Los Angeles Grand Avenue Authority plan - the people are not.